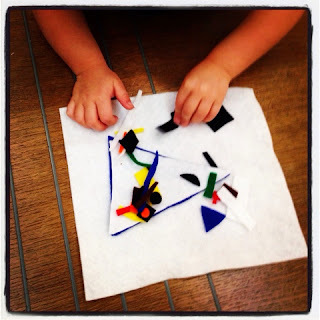 This summer I used the Tate Modern's Malevich Exhibition to explore shapes with the Culturebabies. It was also a great opportunity to introduce a few elements of their heritage. Their Great Grandad was a Russian Cossack. Born at the turn of the 20th Century; he lived through two World Wars and the Bolshevik revolution, escaped the oppression of communism and was able to settle in England, where he raised my mother. 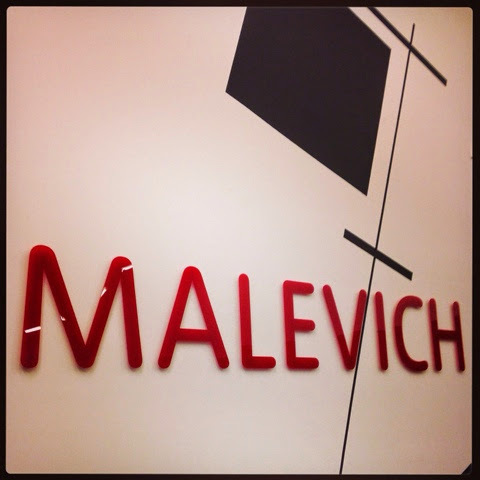 Kasimir Malevich was producing his controversial art whilst my Grandad was a young man. I wish I'd been able to ask him what he thought of it. "the image of the square and all it stood for continued to cast a long shadow across twentieth-century art right up to the present day. It became a symbol for artistic self-determination, the autonomy of art from other philosophical, religious or moral constructs. To this day, it baffles and bewilders as much as it serves as a continual provocation to rethink what we expect the nature and function of art to be." I really enjoyed reading this review of the exhibition from the Observer, which serves as a great introduction to the artist. 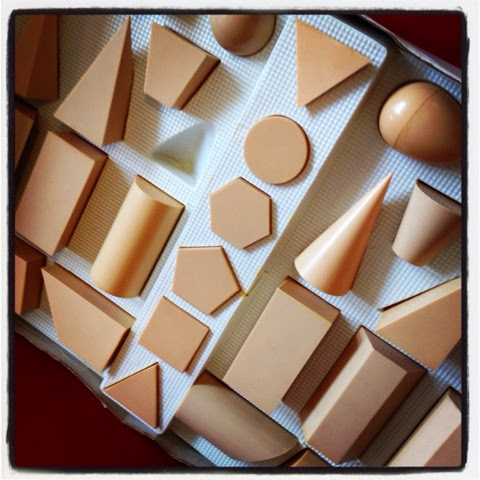 All of this, though fascinating, was of course a little tricky for the Culturebabies to grasp at this stage; however, it did serve as a wonderful way to explore some Russian music, read some inspiring stories and play with shapes. 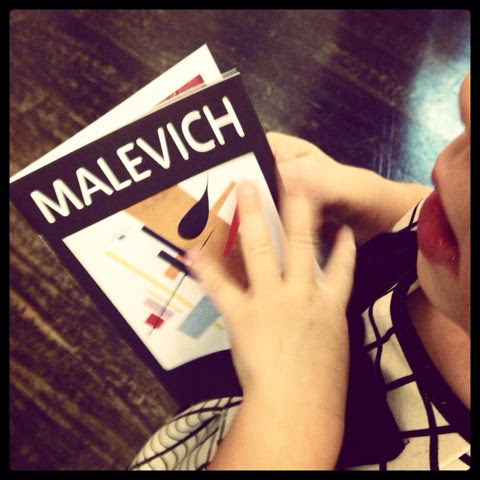 And with its simplicity, bold colours and clarity of form, Malevich's art grabbed the attention of both girls. Culturebaby declared that she liked a number of his more minimalist productions. She favoured the black square, perhaps because it featured in one of her stories; she liked the black cross; she was drawn to works with bright colours and simple forms, more perhaps than some of the earlier and later figurative works. 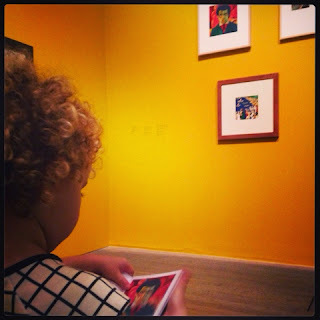 Culturetot likewise stared at the bold forms and visibly concentrated on them. 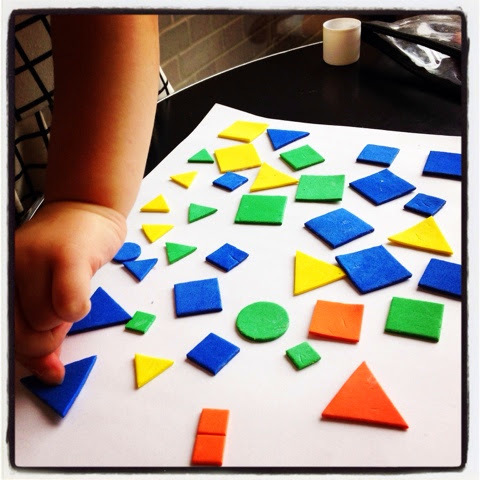 I was interested to hear that Culturebaby's three year old friend had also admired the black square, and, to her mother's surprise, rather than seeing its simple construction had begun to discuss the textures she saw; the bumps in its surface. We began our exploration of Malevich's art by reading, for the zillionth time one of Culturebaby's favourite books Katie's Picture Show, which is the first in an utterly inspired picture book series for children by the author James Mayhew. Katie, the heroine, is taken to an art gallery by her grandmother, and whilst the former is taking a little nap, to Katie's surprise, she discovers that she is able to jump into a painting by John Constable. 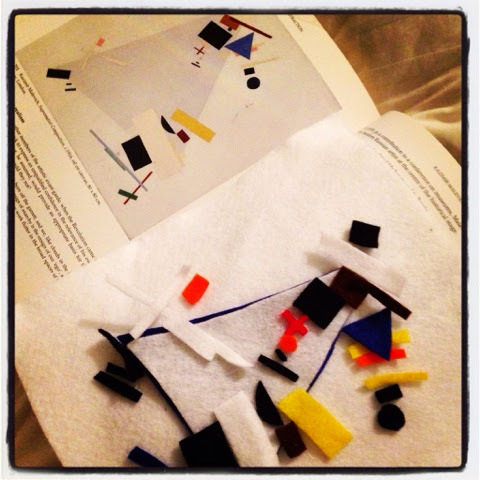 So begins a series of adventures where Katie meets fascinating characters from famous paintings, makes friends, gets into a few scapes and ends up in a rather messy situation when she leaps into Malevich's Dynamic Suprematism, slides down the triangle and has to be hauled out by a gallery guard. (I will write at greater length shortly about this brilliant series, which has taught Culturebaby so much about art and truly inspired her imagination.) 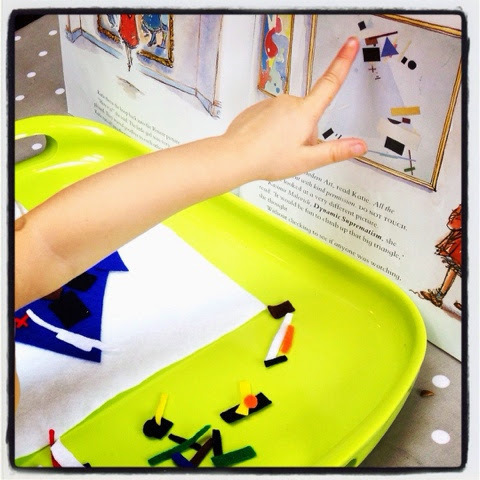 Here we propped up the relevant page of the book for inspiration in one of the Tate rest areas, and began a simple collage-making task using foam shapes, a glue stick and crayons. 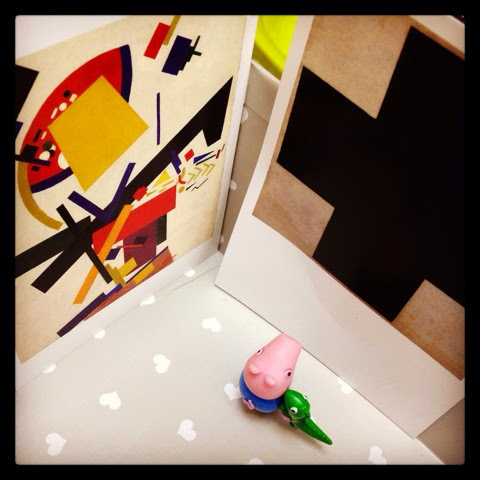 Although Malevich didn't create his suprematist images as collages, it proved a good way for Culturebaby to play with and rearrange shapes easily to produce something recognisable as inspired by his work. She worked for a while on this task and made a number of versions before I managed to entice her away into the exhibition. 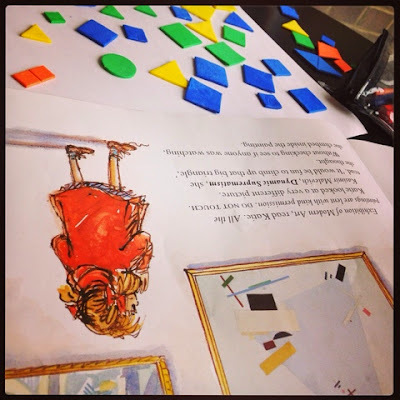 We then began working our way through the rooms, using the free exhibition booklet as an effective game of I-spy, with one item to find in each room. 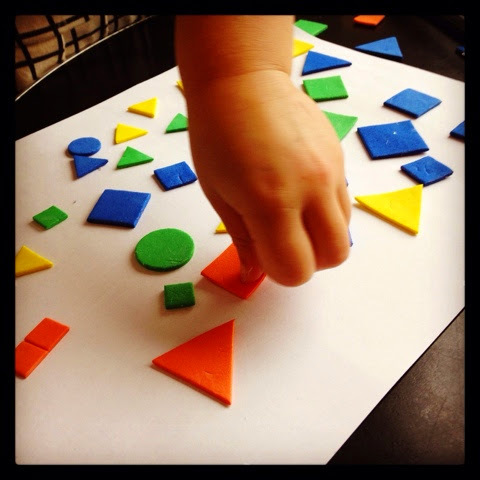 This free resource worked very well. We discussed which paintings we liked the best and particularly enjoyed peering through the mirror to examine the back of the double sided painting on display. We then settled ourselves down in front of work containing black and red squares for our first tactile activity. 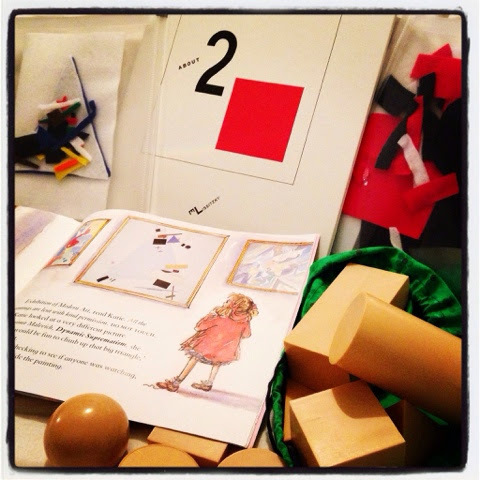 We re-read a beautifully created book we had been exploring for a few days in advance: M Lissitzky's About 2 Squares, which was first published for Russian children in 1922 and has been re-published by Tate to accompany the exhibition. The blurb warned us that this simple book is not just for reading; it is for speaking and for playing; it is about the future! Inside it is dedicated to all children. 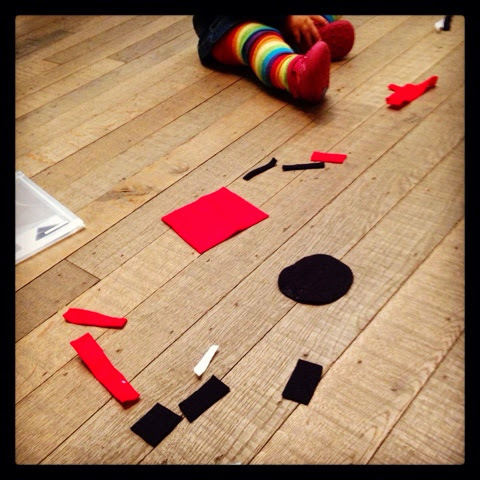 Using six simple plates, the story shows two squares (one red, one black) flying to the earth from far away. The earth is covered with black disordered buildings and is 'alarming'. 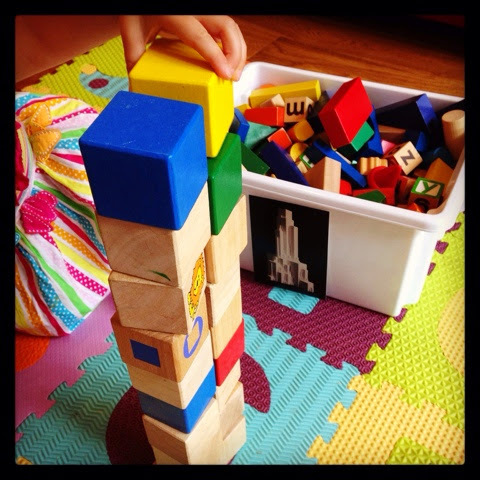 The squares strike and everything is scattered, rearranged, given colour (red); and then it is over. The squares leave again. 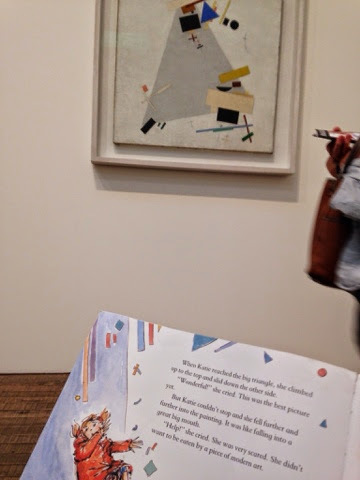 The afterword, rather necessary for parents to read, explains the purpose of the book as visual script where the children become the actors who reinvent the future (as well as familiarising them with the suprematist style). 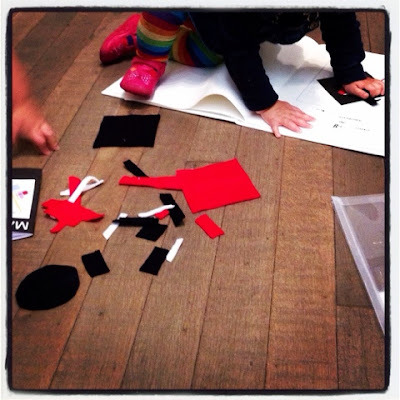 The red and black squares, representing the new art represent the action of freeing the negative, chaotic and oppressive world from its past and creating a new multi-dimensional future - one that belongs to the children who read the book. 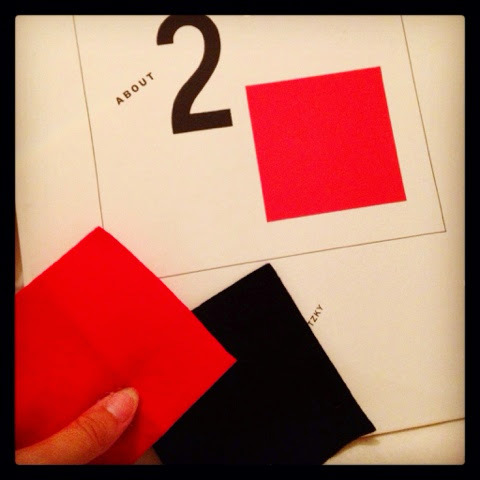 To aid the story I created the squares, world and its buildings from black, red and white felt. It was simple to produce and was a really effective way of narrating the 6 part story to the girls. Culturebaby seemed to enjoy it, though I imagine we will revisit this story when she is better able to grasp the symbolism behind the tale. She did, however, enjoy the element about a square coming from space and rearranging and endowing the world with colour; an interesting idea in itself. 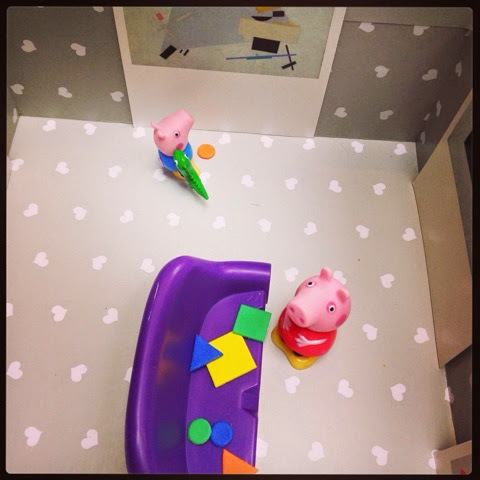 Meanwhile Culturetot thoroughly enjoyed crawling around with, (and eating) the props. 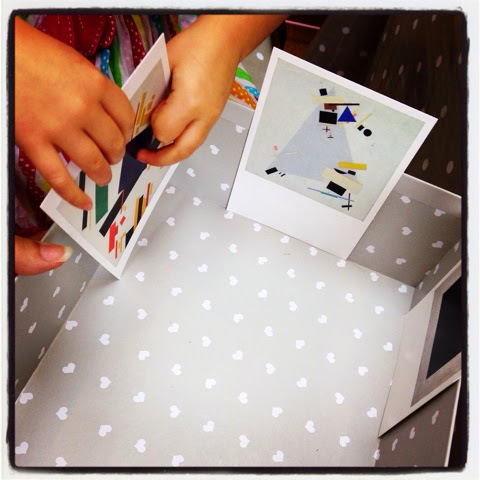 Either way it was a fun way to see the art we viewed in the paintings all around us in a movable and tactile form to be explored on the floor. Next we moved to the, now much anticipated, painting featured in our Katie tale, Dynamic Suprematism. 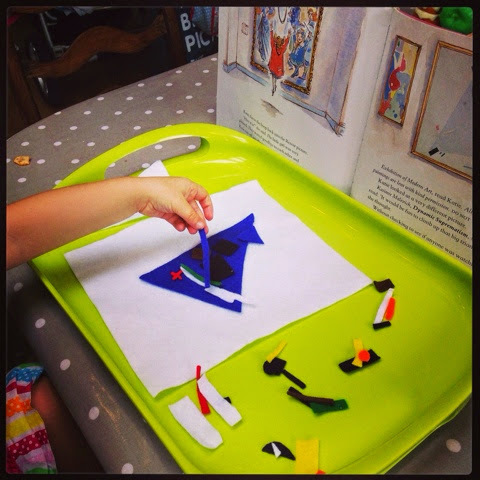 At Culturebaby's request, we again read the story in front of the painting and then we worked for a short time on a pre-prepared fuzzy felt version for her to explore and arrange (it took a matter of minutes to cut-out and prepare and was much simpler to make than Matisse's La Gerbe - though harder to arrange). 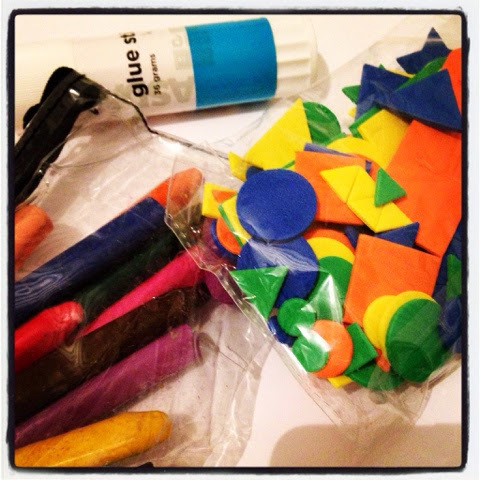 Whilst we didn't spend long on this in the gallery, this activity was requested again on a couple of occasions in the following days. 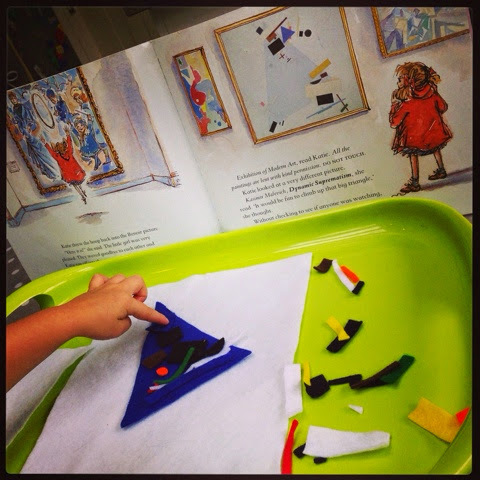 Finally, we used a small mystery bag of three dimensional shapes to send Culturebaby on a short shape hunt around the pictures in one of the galleries. 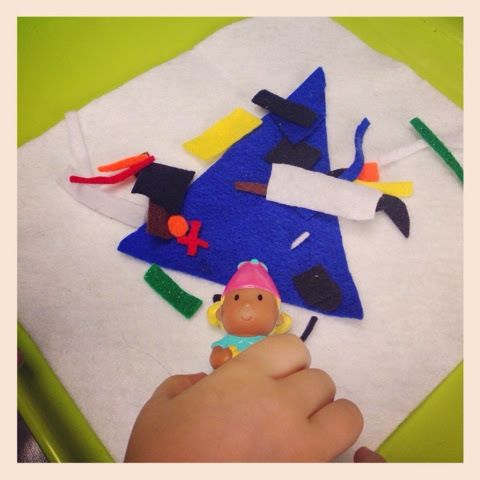 (A mystery bag is great for sensory development as the child closes their eyes and feels a shape, tries to describe and identify it before they pull it out of the bag). 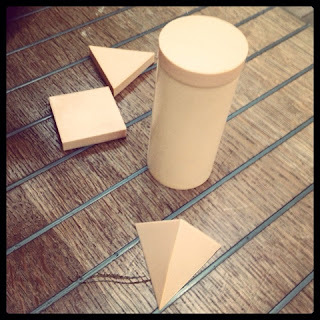 Meanwhile Culturetot handled these shapes on the floor. Unfortunately at this point we encountered one of those tricky exhibition goers - the middle aged chap who wants to view art in meditative silence. He stormed over to the guard in consternation that we had been reading in front of a painting (a story about the painting in question) and were being too active for his liking. We decided to leave (semi) gracefully at this point as my mid-potty-training tot also needed the loo and I couldn't face either a demoralising debate or, worse, a puddle on the floor. This whole area is a tricky one, and we'd be interested to hear views. I love a peaceful atmosphere at times when I visit a gallery, but I'm also inspired by seeing how others are appreciating the art too. 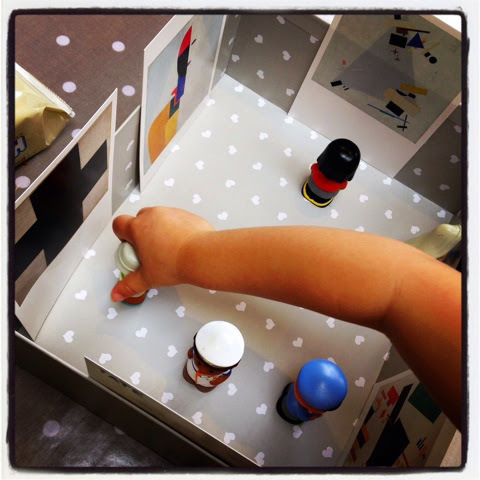 Adults can also make a good deal of noise, and it is even harder for young children and their parents to feel welcome when their little ones need activities and tactile ways to engage with certain works to get the most out of a visit. I had a chat to one of the managers afterwards, who thankfully reported that the attendants had thought we were absolutely fine; but I did let her know that a guard's comments could put off a rather less hardened gallery-goer forever, which would be a real shame. I'm not sure what the solution is so that all art appreciators large, small, louder and quieter can co-exist. 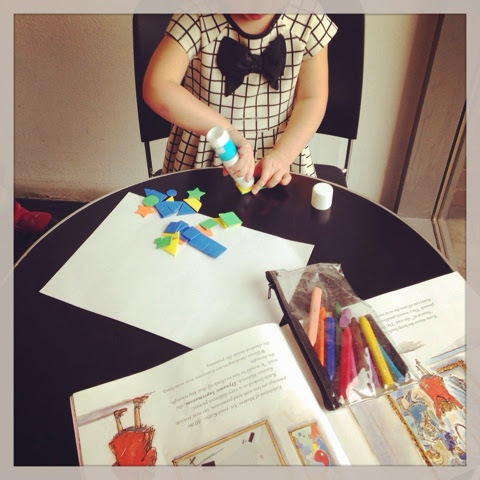 I've suggested time slots where some hours are designated as quiet sessions and others as noisier sessions where children and activities are welcome. Either way, thankfully we saved a number of our more active games for the following days after the exhibition. 4. 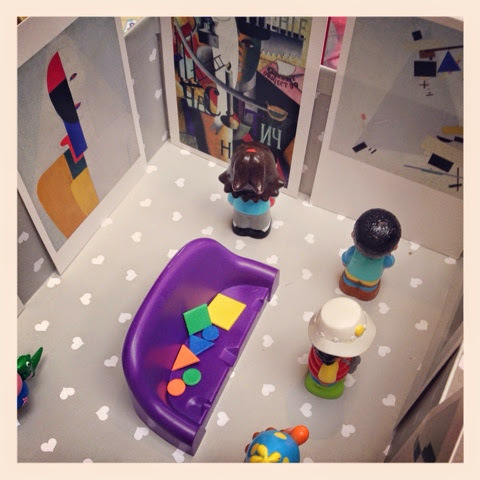 Culturebaby had another go at recreating Dynamic Suprematism, and we acted out the scene from Katie's Picture Show where she gets lost in the painting. 6. And finally we listened to some Russian music. I think the very best way to introduce tots to the storytelling component of classical music is through Prokofiev's Peter and the Wolf (we will blog about this shortly). We also trotted around to the amazing piece Troika from Prokofiev's Lieutenant Kijé and sang along to the traditional lullaby Kalinka. We were also delighted to receive to review, Tate Publishing's translated re-prints of two original Russian children's books from the 1920s, which are the perfect accompaniment to the exhibition. These are works of art themselves and are both stunning in their original conception and extremely high quality in their reproduction. I found these books so interesting to examine on a personal level as these would have been around at the time when my Grandad had his first children in Russia. These were perhaps known to his family. They are also fascinating as they were part of the revolutionary art of the period and were also part of the Soviet Government's programme to educate the children of this new age in the ways of the future. I find elements of this rather sinister as the Granddaughter of a man who saw the damage done by the Stalinist regime in his country an escaped it, but the books in themselves actually make good stories and even more useful historical learning material. Leading figures in this production of new titles for children with their bold and experimental images were the artist Vladimir Lebedev and poet Samuil Marshak, who created both the titles we received: Baggage and The Circus and Other Stories. Lebedev was interested in cubism and European Impressionism and Marshak was fascinated by English nursery rhymes with their rhythms and lack of sentimentality. 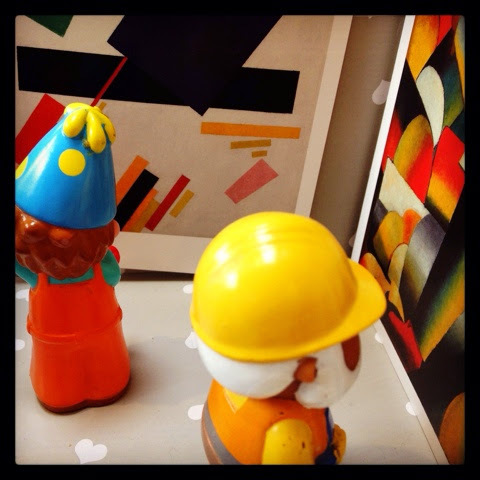 Both wanted amusing and playful books that would also contain important messages about the importance of progress. 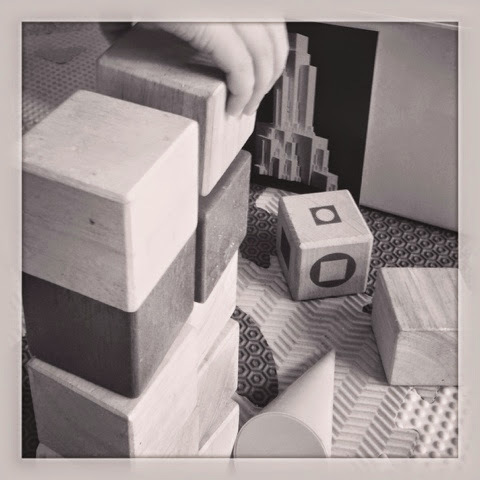 Particularly interesting are their stories about Yesterday and Today (dealing with the material changes in household objects the children would have experienced) and How the Plane made the Plane (a tale about the creativity of labour and skill). I was also intrigued by the separate tale Baggage in which a Bourgeoise lady checks in her luggage for a journey - including her little dog. The dog is lost and replaced with a large mongrel, which the railway staff try to persuade her to take instead. The afterword reports that the intention of this tale is to highlight the problems when a keeper of the old ways is too sentimental for what is gone and unwilling to accept the new. Interestingly, with my sense of this history, it smacks of theft and the replacement of quality with something that seems bigger and newer but is ultimately inferior. Perhaps with the benefit of hindsight my Grandad would have read this in the same way. Clearly these tales had an agenda at the time, but I will use them in the future as an accessible source when I start to teach the girls about the fascinating history of their Great Grandfather and the stuggles he experienced. For this, and as part of any child's education on the period, these books are intriguing, welcome and immensely valuable. 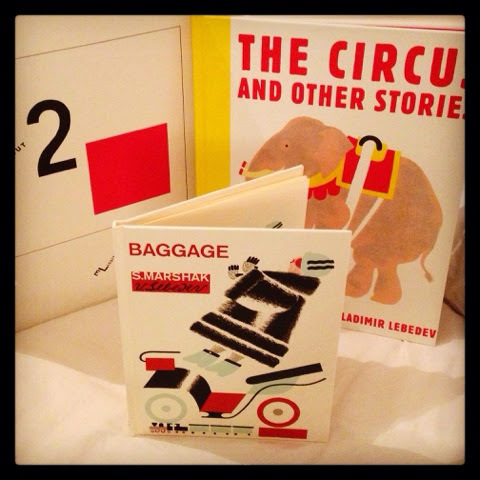 Disclaimer: We received copies of Baggage, The Circus and Other Stories and About Two Squares from Tate Publishing for review purposes. All views are as always, my own.